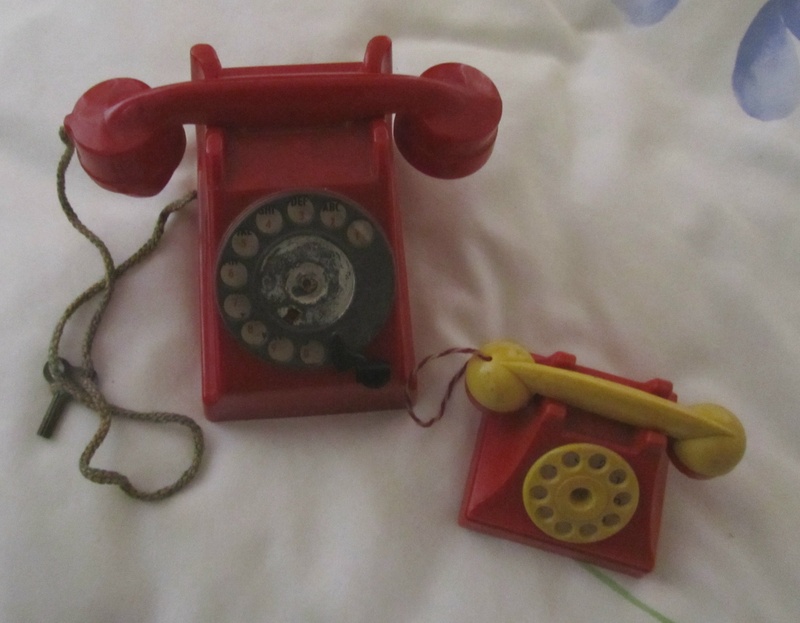 The bright colours and stripy string of this late 1950s telephone delighted me, as did its tinkly bell inside the toy. I remember playing with it a lot. But, of course, I was only little when I bought it and, before long, I’d grown. I couldn’t play satisfactorily with it as it was too small to reach from ear to mouth. 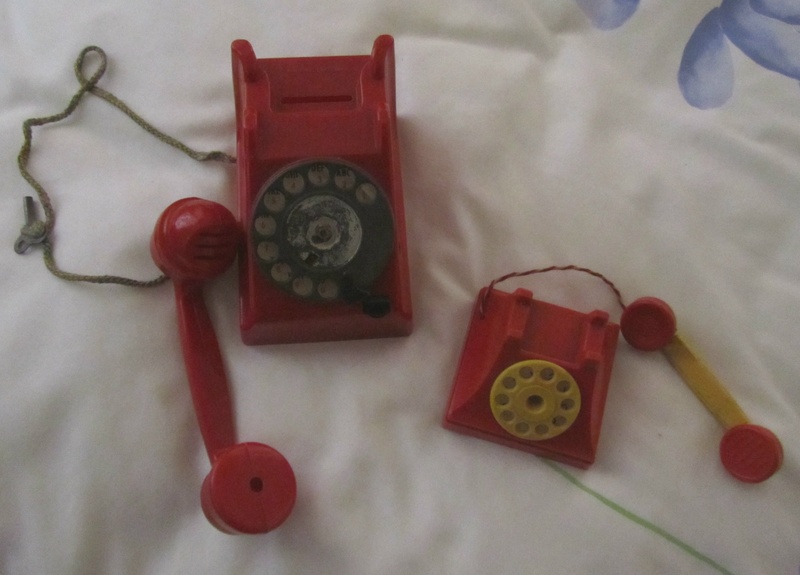 Then, some years later, I spotted this red telephone in a toy shop window in my home town. At the time, in the early ’60s, this is exactly what telephones looked like, except, like ours at home, they were usually black. I fell in love with it straight away, and eventually saved up enough to buy it. It was the right size for – how old was I then? – maybe an eight-year-old. The key, which you can see attached safely to the telephone cord (and never removed; this is how it came), fitted into the side of the phone. Once wound up, you could press the little lever and it would ring. Two presses in quick succession created a realistic ringing tone. And whereas the dial of my first toy telephone simply rotated, this bigger telephone’s dial behaved exactly like a real one. It was big enough for a child’s finger to fit inside and as you dialled a digit, and released it, the dial slowly turned back to position. The fact that the toy was designed to double up as a money box didn’t bother me in the least – the main thing was: I could play at offices! My office was that of a publishing house. I was editor of a weekly called Morning Magazine. This magazine I produced every week without fail for my family’s enjoyment. (At least, I hoped they enjoyed it – obviously, my motivation was less to please them than myself.) I loved drawing, so the magazine was packed with fashion pages and nature study – how to recognise birds, butterflies and wild flowers; how to look after your pet mouse (I had a pet mouse, called Tippety), or how to care for your cat (we had a tabby and a black-and-white). I designed advertisements, thought up sales’ slogans. I wrote (and solicited from my parents and siblings) Letters to the Editor. Then – my favourite part – were stories and poems. I would often add those – usually my own – sometimes, though, I would put in a favourite classic poem – probably by Walter de la Mare or Robert Louis Stevenson – my staple poetic diet at the time. My other favourite content was a Puzzles Page. I loved making up puzzles – hidden words in sentences, jumbled letters of boys’ and girls’ names, drawn to look like faces, and jumbled lines or ‘strings’ linking, say, three kittens to three balls, where the reader had to work out which belonged to which. (All the sorts of puzzles that I loved doing myself.) Morning Magazine would also run competitions, which my family – my parents in particular – were kind enough to enter. The prize was always either A Page of People or A People Scene. I just loved drawing people. A Page of People would consist of rows of children and adults in different styles of dress – there would usually be one or two in school uniform, a brownie and a cub scout, a vicar and a tennis player, a baby and a toddler and, almost always, a pair of twins. A People Scene might be anything from a children’s playground to an orchestra, a church wedding to a field of campers, busy around their tents. Morning Magazine is no longer published (!) but it did run and run for years with very few weeks missed. It cost 0d. (The price appeared on every cover.) That is, of course, 0p in decimal currency. When I grew up I knew I wanted to be an illustrator and/or an author. I loved writing stories and poems and I adored drawing pictures. Well, here I am, still at it. Funny thing is, though, I no longer very much enjoy talking on the telephone. So some things change. One thing I liked about toys in the mid-20th century, when I was a child, is that you could role-play with them. Toy cars were identical to those you saw being driven around town and country; dolls looked like babies and children so that you could play mums and dads. (Well, mostly ‘mums’ if I’m honest!) By the late 20th century this was much harder – cars didn’t look real, they were weird and wonderful: fictional character-props, such as ‘batmobiles’ and other fantasy-toys; dolls were teenagers so that children could aspire to identify with them rather than mother them. Well, each has its merits, but on the whole, I think I belonged to my era. If you pop over to the 1950s page, you can see what I mean about Real Life Role Play. And whether to play with or admire, if you like miniatures, you’ll love these authentic facsimiles of food packets of the ‘fifties! They even have instructions and recipes on the backs of the packets. With Christmas approaching I wonder how many parents are concerned about the educational value of the presents they buy for their children? I’m sure toy-makers will still use this label in the hope of securing extra sales. But how educational are ‘educational toys’? Not very, as far as I remember from my own 1950s infancy. If you’d like to see my early toys promoting letters and numbers have a look at the newly updated 195os page. Do you have a kaleidoscope? They are timeless toys and provide endless fascination, I think. Even when you know ‘it’s all done with mirrors’ – and, indeed, at High School we made our own in one Science lesson – the changing patterns are still amazing and delightful to watch. Go to the ‘My toys from the 1950s’ page to read more and see some of the lovely kaleidoscopic images. It’s a while since I spent time on this blog. Have been very busy with grown-up life and had little time to look back on my childhood. However, I have just added one of my dolls to the dolls page and hope to add more 20th century toys and dolls over the next few weeks. I think my Brittain’s miniature garden, dating back to the mid-1960s, might be next. Keep checking the pages on this site for new additions. A quick dip into the 19th century! 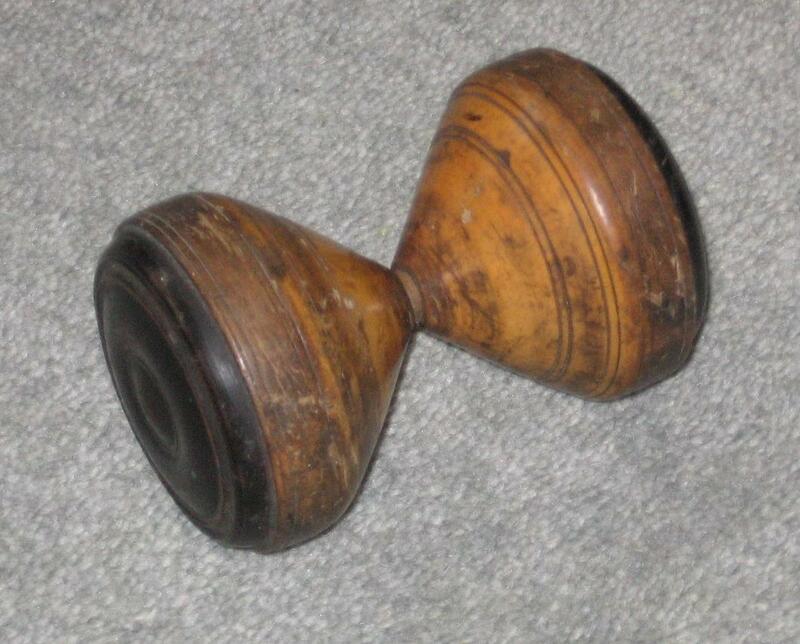 This beautifully crafted wooden diabolo is over 100 years old. It belonged to my grandmother when she was a child. She was born in 1886 and passed the toy on to my mother (born in 1920). My mother remembers playing with it as a child but told me that she preferred her new 20th century one, almost certainly made, as she acknowledges with hindsight, of inferior wood and workmanship. Each side of this original toy would have been hand-turned separately, and carefully weighed to ensure an even balance. The player could do tricks with the spinning diabolo, as it balanced on a string. It was as popular as the ubiquitous yoyo. This website shows tricks that can be performed with a diabolo. Welcome to Celia’s Virtual Toy Museum! Diabolo Tricks Instructions, descriptions and animations of tricks to perform with a diabolo. Le petit musée du diabolo The Little Diabolo Museum – a French site, including video of diabolo action.